X-ray spectroscopy applications and equipment are becoming more portable and are entering harsh environments away from controlled clean environments. This results in a need for more robust X-ray components which are able to handle harsh environments. We are measuring the resistance of different X-ray windows produced by Moxtek Inc. to corrosive and harsh environments. 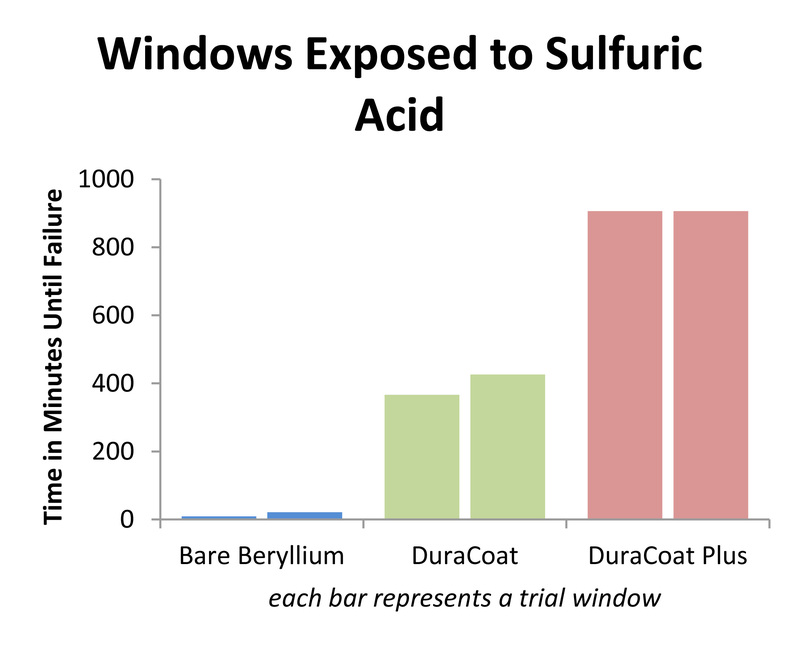 Bare uncoated beryllium, DuraBeryllium, and DuraBeryllium Plus windows were used in each test. Each window consisted of a 100 μm thick beryllium foil. The DuraBeryllium had a chemically resistive coating (DuraCoat) applied to the beryllium foil. The DuraBeryllium Plus had two different coatings applied to the beryllium foil (DuraCoat and Plus). Most applications require the X-ray windows to be baked at high temperatures in assembling X-ray detectors. The first test was designed to see how chemically resistive the windows were after being baked. Windows were baked at 400°C, 450°C, and 500°C for five hours. One group was baked in air and another in vacuum. After being baked, a solution of 1% hydrochloric acid was dripped on top of the window for a period of time and then checked for leaks on a helium leak detector. A window was considered to have failed if a leak rate greater than 1 x 10-10 mbar*L/s was observed. The windows were repeatedly exposed to acid and checked for leaks until they failed. 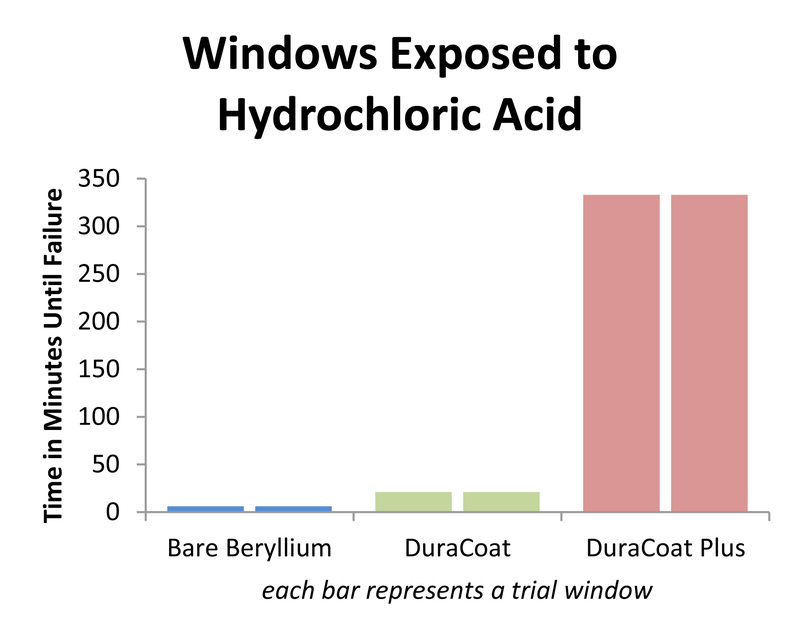 5% concentrations of hydrochloric acid, sulfuric acid, and hydrofluoric acid were dripped on X-Ray window for a time period followed by a leak check then repeated until found leaky (>1 x 10-10 mbar*L/s). The final test consisted of exposing the X-ray windows to a variety of common petroleum based fuels. Windows were dipped into regular unleaded gasoline, diesel fuel, and kerosene for month long intervals and then checked for leaks on a helium leak detector. The following two graphs show the results of the X-ray windows exposed to high temperatures and to 1% hydrochloric acid. 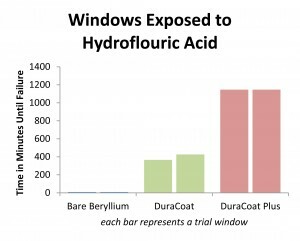 The graphs below show the results of the windows exposed to 5% concentrations of hydrochloric acid, sulfuric acid, and hydrofluoric acid. X-ray windows have been exposed to petroleum based fuels for a total of eight months thus far in which no measurable change in leak rate has been observed in any of the X-ray windows tested. 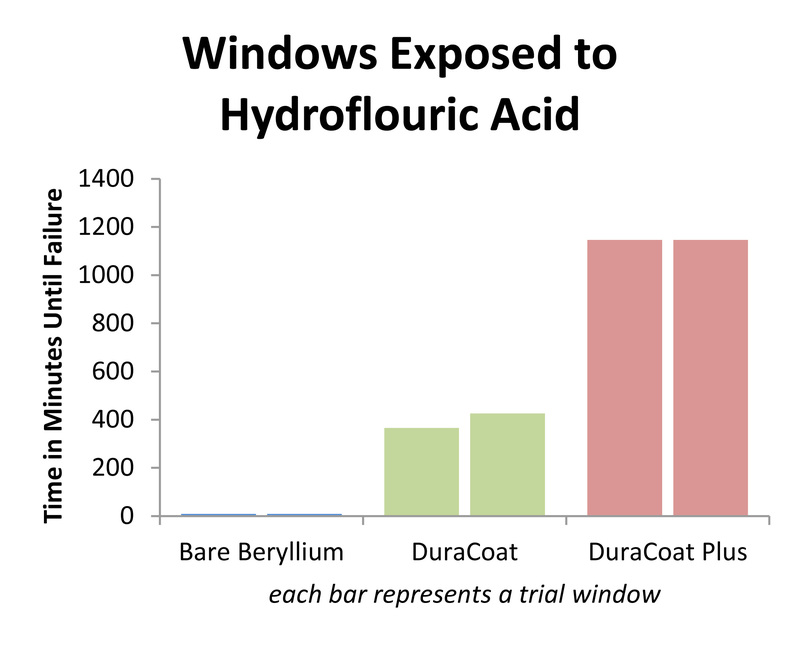 DuraBeryllium Plus windows demonstrated the greatest resistance to a variety of corrosive elements. 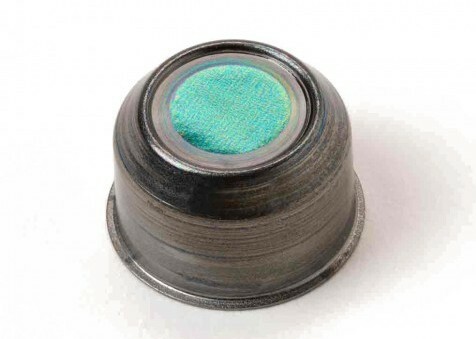 This resistance was seen even after the parts have been baked at temperatures up to 400°C. In detector manufacturing processing under 400°C will fully preserve the chemical resistivity of the DuraBeryllium Plus windows. 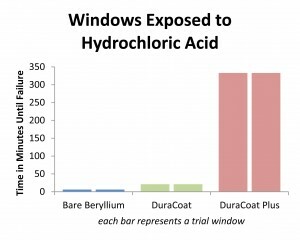 DuraBeryllium windows, while not as resistive as DuraBeryllium Plus windows, do demonstrate significant resistance to acid corrosion than do bare beryllium windows in non-baking applications and in those baked up to 400°C in vacuum. 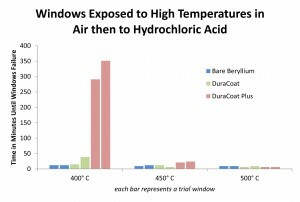 Both coated and non-coated X-ray windows have relatively high resistance to corrosion from petroleum based fuels. 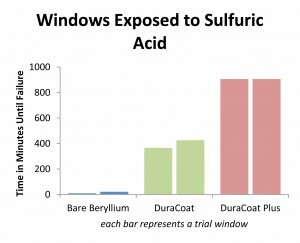 Applications that require windows to be exposed to high temperatures or to be exposed harsh environments will find the best performance from Moxtek’s DuraBeryllium Plus windows due to its greater chemical and temperature resistance.